Our friends at Sam Ash Music were kind enough to take the time to make this video with Jonathan Pines (of Fingerprint Audio, our US Distributor) and some of our favorite guitar microphones: the VR1 and VR2 ribbons and the sE2200 condenser. Jonathan has recorded guitars for Larry Coryell, Adrian Belew, Wilco and more, and he does a great job explaining how to listen to your instrument, pick the right mic, and experiment with mic placements to achieve a multitude of different tones. Nashville musician Bennett Lewis (Of Montreal, Lera Lynn, HoneyHoney) has been using his Gemini II on a variety of projects at his home studio in Tennessee. We asked if he'd mind sending us some samples of the mic on his fine collection of string instruments, and he kindly obliged. Have a listen! "Glad you dig the clips! Had a fun time making them. The mic is an absolute pleasure. Really warm and rich, yet plenty of high end sparkle." Bennett is currently out on tour with Lera Lynn, known recently for her appearance on Season 2 of HBO's True Detective. Check out their tour dates on her website. Adam Lee - known best on YouTube as @AdamLeeGuitarist - has a pair of sE5 small-diaphragm condensers, and was kind enough to send us these 100% natural, unprocessed recordings to show how he's been using the mics. Adam: "The piano in this example is an extremely old Bechstein model A (6 feet in length), built in 1892, and is in need of some repair to get it sounding its best. It's a dark-sounding piano, because I voiced it that way when trying to overhaul the instrument to the best of my ability. In the room, the tone of the instrument is stunningly rich and soulful, but this makes it challenging to record, without the resulting sound being on the darker side." "I opted to place a stereo pair of the sE5's about 20 cm over the strings: the first mic being placed over the dampers, angled at the hammers to capture the sound of the strings being struck. The other was pointed towards the middle of the soundboard, which captures the characteristic midrange of these older pianos that is so defining of their tone. The soundboard is also fractured in places on my instrument causing it to buzz slightly in places, and the sE5's are exceptionally analytical in transmitting this, so this placement minimises the pick-up of these unwanted sounds, while still capturing the tone of the piano. Every piano is different, but I'm confident that these microphones will naturally and articulately capture the tone of your piano. They really are a great choice, and have helped me achieve some beautiful recordings - even with my beat-up Bechstein!" Adam: "For recording acoustic guitar, once again, I seem to have a darker-sounding instrument than most. The guitar I use is capable of a very rich, woody tonality, but at the same time outputs a very airy high end. 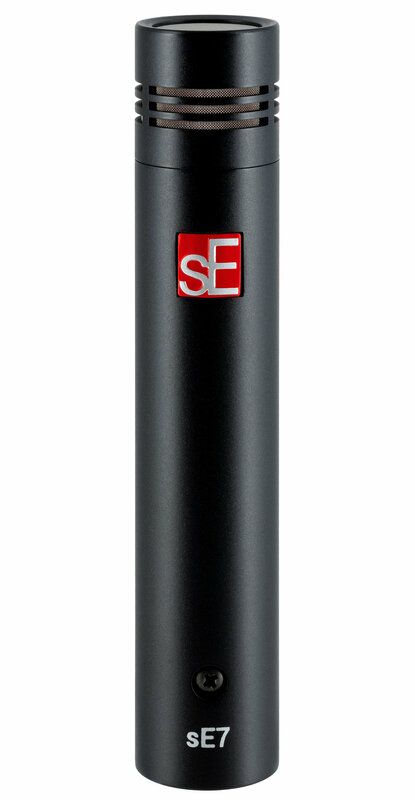 The full spectrum of these sounds was captured by the sE5's in a way that no other mic I have used has done." "I used a stereo pair mounted on the included stereo mounting bar, with one mic pointed towards the 12th fret, and the other over the sound hole, but angled towards the bridge, so as to avoid an overload of low frequencies. Both mics were at a distance of roughly two feet from the instrument. The resulting sound is huge, rich and detailed - with no processing required at all. Panning the mics out left and right paints a very realistic stereo image of the instrument, and has given me some of my most beautiful acoustic guitar recordings."